We love our backyard. It is one of the main reasons we bought our house. 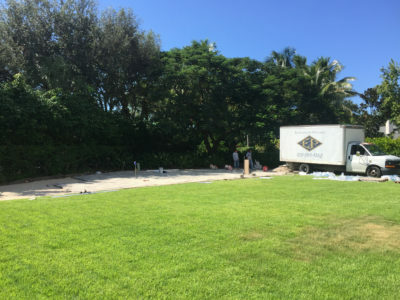 When we looked at this house, the conversation between my husband and I went something like this…”ummmm, we love this neighborhood, but this house is totally outdated and needs to be completely gutted, which is a TON of work and will take forever. But wait a minute, WOW, look at the size of that yard! Hmmmmmmm. Should we buy it?” Yes, the house did need a complete gut job, but the yard was huge and had SO MUCH potential (as did the house!). We bought it, of course, because we are crazy, and love to torture ourselves. But finding a yard like this around here was just what we were looking for and are hard to come by in this neighborhood. If you’ve been following me for a while, then you know that we did end up gutting the entire house and you know all the work that went into it. We’ve been doing projects ever since we moved in. If you are new to my blog, check out the history and all my DIY Adventures. Anyway….today I will be talking about the plethora of Outdoor Projects we’ve done. 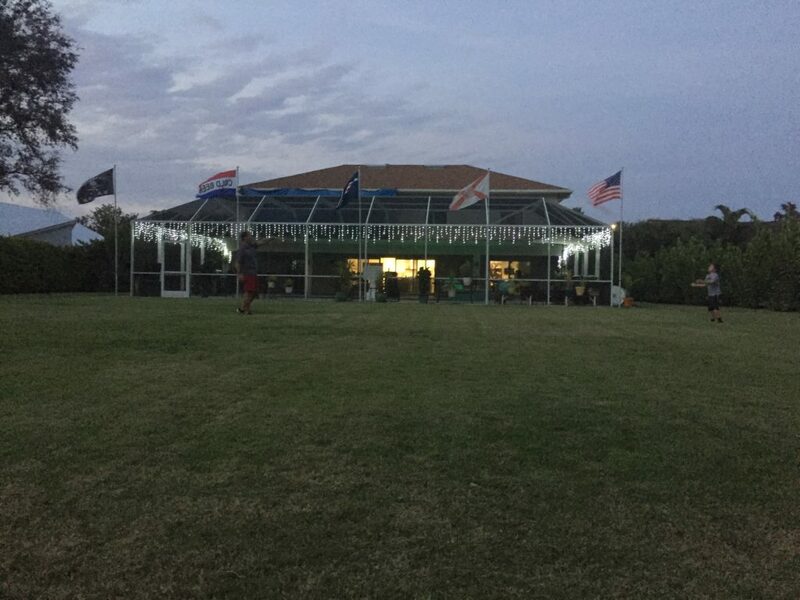 Below is the view of the backyard from the real estate listing, and what made us say WOW. 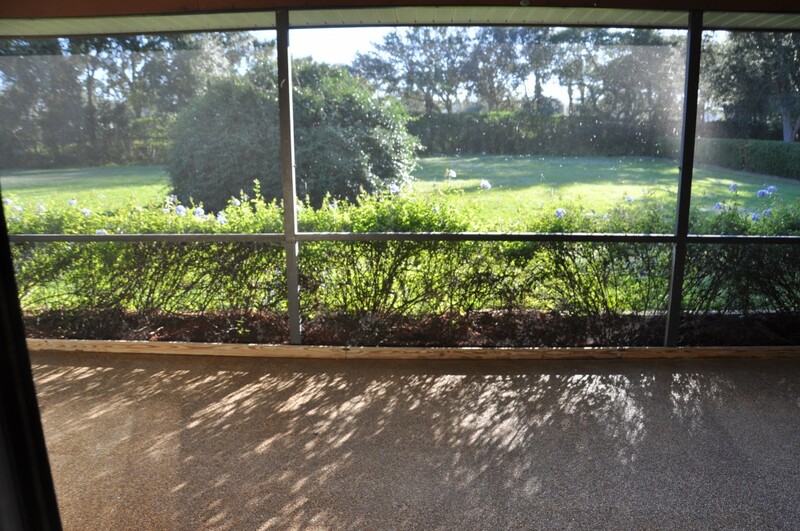 This picture was taken from the old lanai. Look how big the yard is! It is huge and flat and private. One of the first things we did was get rid of that huge overgrown bush/tree thing smack dab in the middle of the yard to open it up even more. 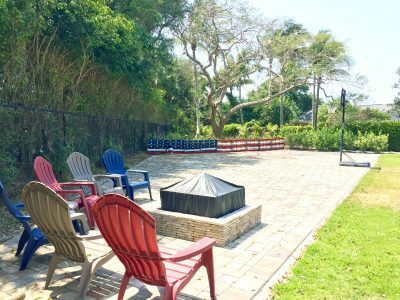 My husband had the idea to put pavers in the back section of the yard to act as a sports court for the kids and a fire pit/entertaining area for the adults. This was NOT a DIY. We hired professionals for this since this is a large area and would have taken us FOREVER. We’re not that crazy. 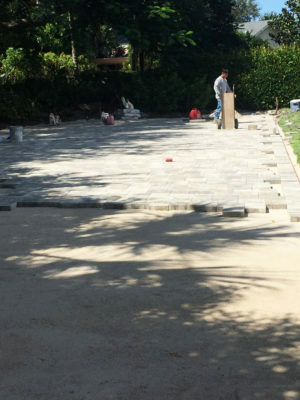 Once the pavers were done, we started doing our DIY Projects. 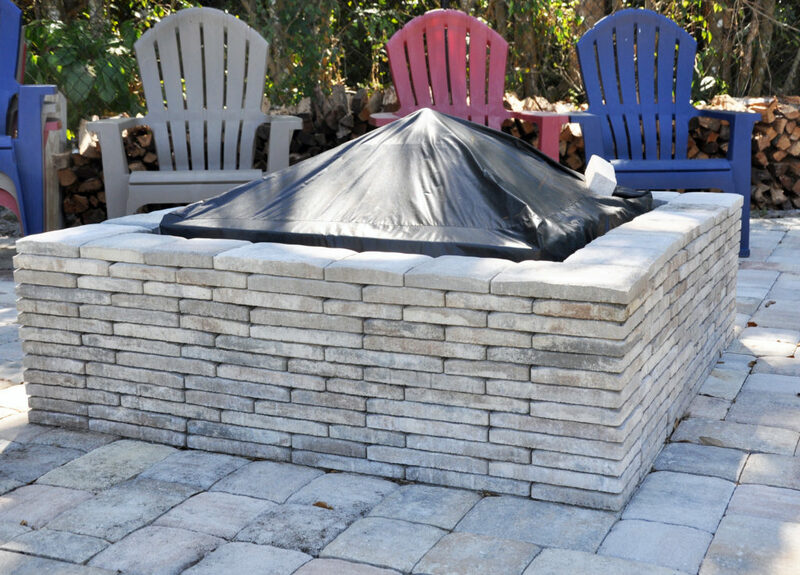 We built a fire pit using left over pavers from our pool installation. 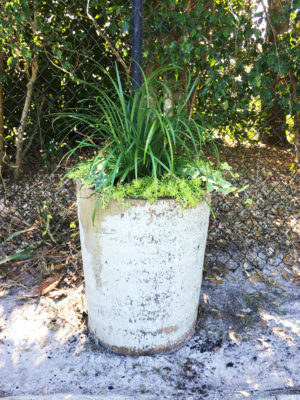 There is a backstory to our leftover paver supply. When our house was getting renovated, there was a huge dumpster in our driveway for months. One day my husband and I pulled up to check on the work being done to our house, and noticed all these pavers in the dumpster. The workers installing the pool had thrown them all away! What? Perfectly good pavers? Why? Apparently they had one pallet of the wrong color, and rather than return them to the warehouse they just threw them away! Naturally we did what anyone would do and we went dumpster diving and fished these pavers out! LOL Ok, so maybe not everyone would have done that. I mean, I don’t normally dumpster dive, but this was a necessity. Also, it wasn’t like there was food and stinky trash in there, it was just building supplies, so it wasn’t that bad. We knew we would use these pavers someday, somehow, somewhere. And, we did! We used them to make a fire pit, and later we used some for our Tiki Bar! Yup, we actually took that many out of our dumpster. Anyway, making the fire put was very easy. All we did was carefully stack pavers all around our current fire pit (and by we, I mean my husband). It doesn’t get much simpler than that! As you can see, our current fire pit is very well loved/used and getting a little rusty. When this ones gets really bad, we can easily take it out and replace it. 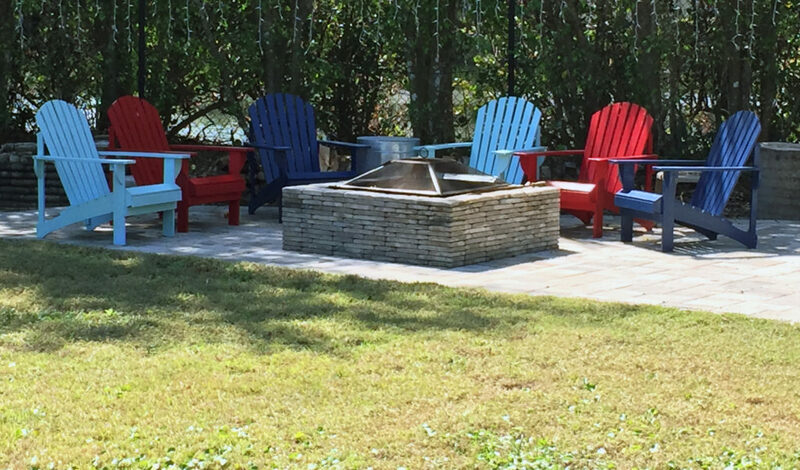 We had plastic adirondack chairs around the fire pit (and we still have some that we use for parties when we need extra seating). 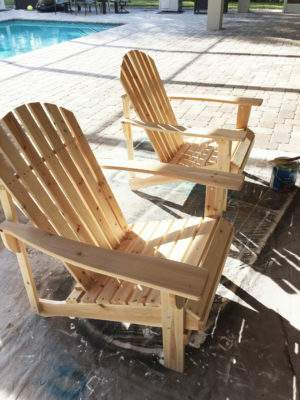 Some of them broke and all of them faded in the hot Florida sun, so we decided to invest in some nice wooden ones. The good PolyTeak ones, like these, are $250-$300 each, or more. They last forever but spending over $1000 on chairs was not in the budget. Other wooden chairs, like these, are a little less expensive, but still pricier than we wanted to spend. We found these at Home Depot on sale for $29.99 each, and quickly bought 6! They are currently listed at $69. 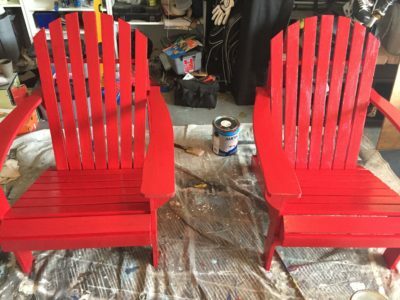 We had to put them together ourselves, and paint and polyuerthane them, but doing that saved us a LOT of money. It helps that I enjoy doing projects like this. If you don’t enjoy this stuff, buy the already painted ones. I used left over paint in our garage from when my husband made this pallet flag fence. 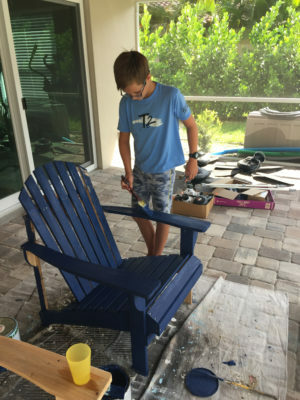 I painted 2 red, 2 navy and 2 the same blue as the Tiki Bar, Tropical Lagoon. I had a helper for a couple of the chairs. I used outdoor polyuerthane to protect them from the weather. We’ll see how they hold up. So far, so good! 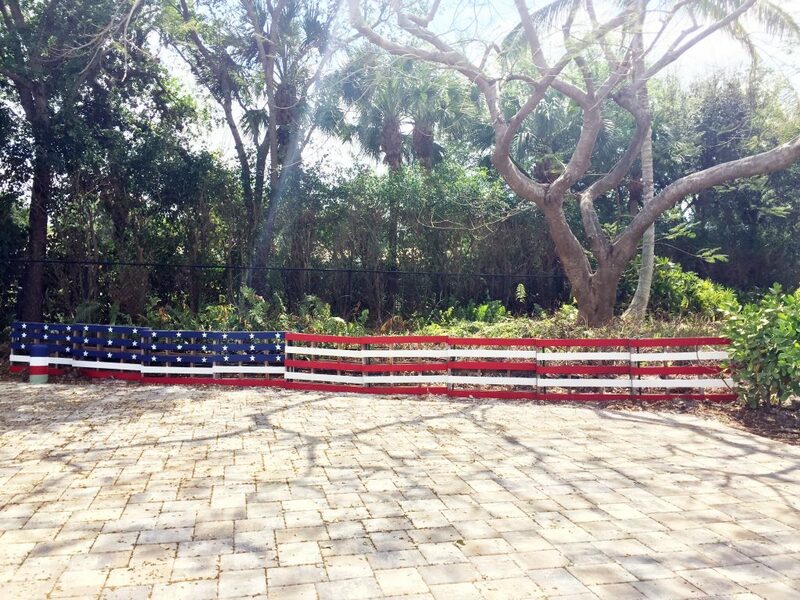 Speaking of the pallet Flag Fence….How cool is it? My creative husband came up with this idea and put it all together himself using the stack of left over pallets from the construction workers. 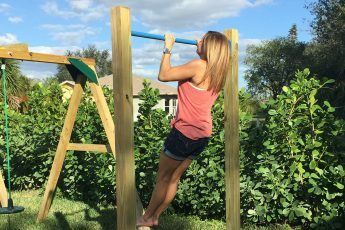 My husband and a friend built these swing sets too, using kits from Home Depot for our youngest son’s Ninja Warrior Birthday Party. We later moved this swing set to the side of the yard. 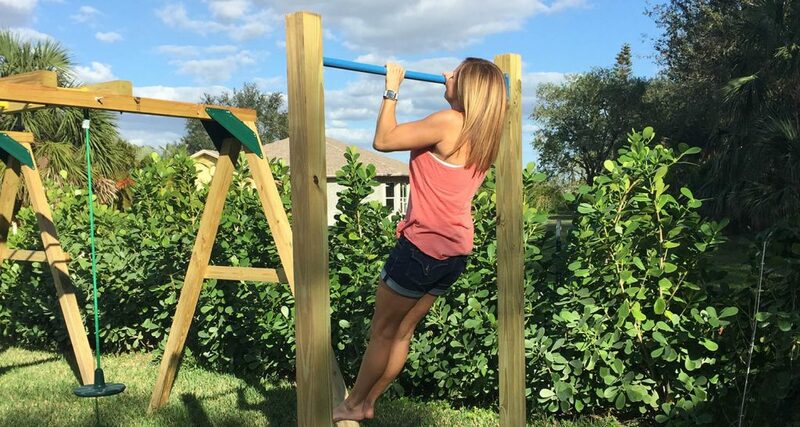 I can’t forget the pull up bar my husband and I built too. 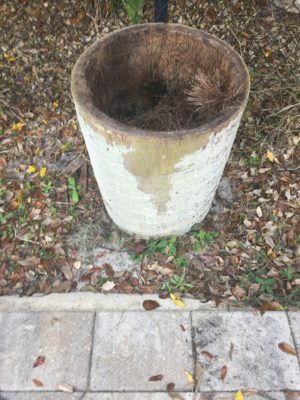 I made these planters out of tree stumps left over from Hurricane Irma. We planned to use them as tables or stools, but the insides ended up rotting out so I thought they’d make perfect planters. So far the they are working out great and the plants are growing well. 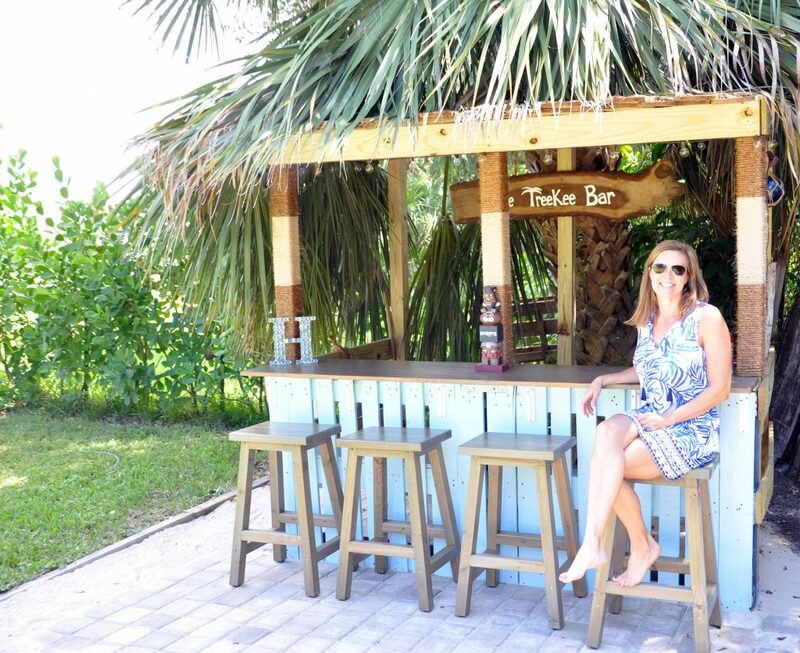 And last but not least is our tiki bar, aka the TreeKee Bar that we built using some free pallets. We love how this turned out and it was been fun when we have friends over or big parties. And here is a view from the fire pit towards the house. My husband and our youngest son were playing catch here so I snapped a picture. 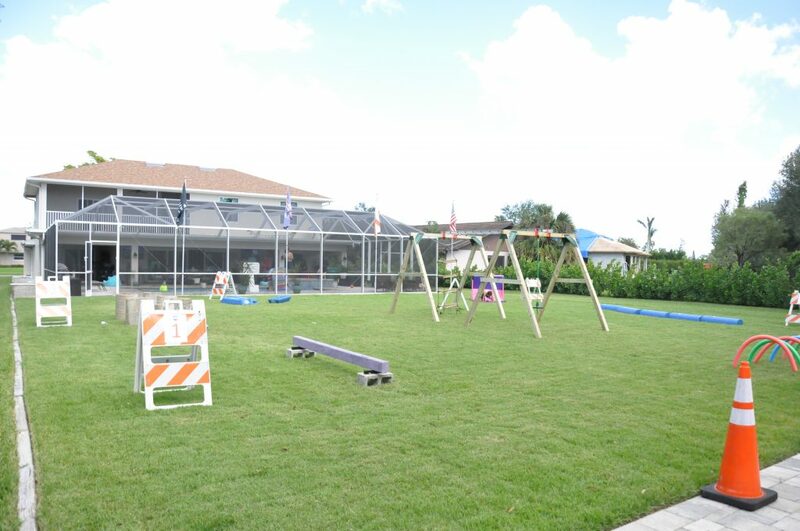 We are lucky to be able to use our yard all year long in Florida and we do! 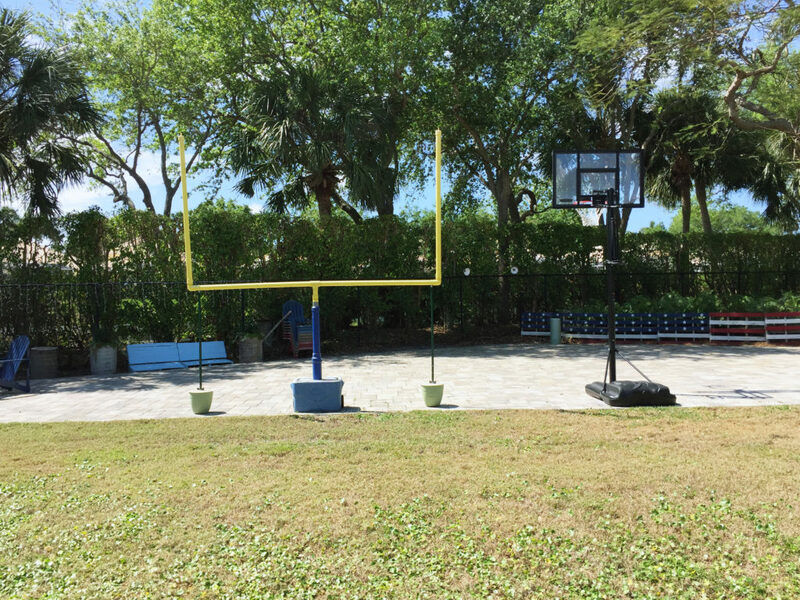 What fun things have you done to your backyard?